For the ‘La Romantica’ model, Jellinghaus begins with the work of Rene Francis Lacote, who built in Paris from 1785 to 1868. 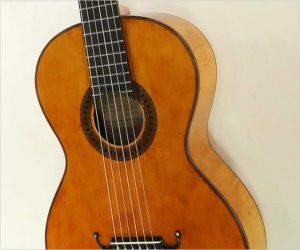 At the time, the guitar was becoming more and more popular, but the bracing designs limited the amount of volume it could produce – and consequently the size of the audience. Here at The Twelfth Fret we frequently see original Romantic era instruments. 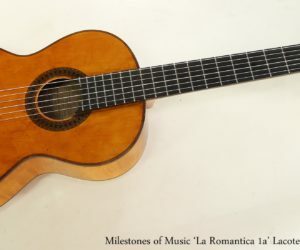 Here, we’re looking at an impressive modern reproduction of a Rene Lacote guitar, named ‘La Romantica’ by Milestones of Music. This is one of the older pieces in our shop at the moment – a fully functional Romantic guitar by Stephan Thumhart, built in Munich and dated to 1820. It features a modern 25.5 inch scale length, spruce top, and figured maple back and sides. The neck of this Stephan Thumhart Romantic Guitar is maple with ebony for the fingerboard and pin bridge. It has had many repairs over its nearly two hundred year history, but works well. Recently a number of Martin Size 5 Terz guitars were built, recreating one of the most popular Romantic designs and the guitar favoured by Marty Robbins. 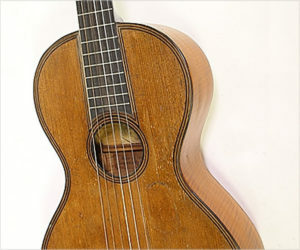 Terz guitars were immensely popular in the early 19th century, and were often paired with full size guitars. 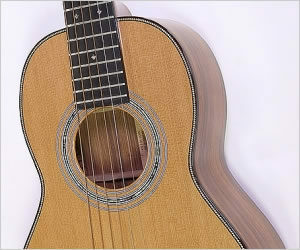 The Terz is tuned up a minor third, to G – an equivalent is placing a capo on the third fret. 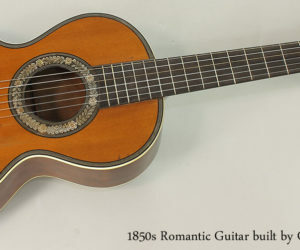 During the 1800s there were many romantic guitar builders, in Paris, London, and other European cities. This fine example was built in Paris around the 1850s and is stamped ‘Coffe’ and signed Coffe – Goguette by the neck block.